All information, unless otherwise noted, from a promotional webpage aimed at reviewers and booksellers. It’s just what I found curious. That was my only criteria for quoting. Based on these blurbs, one of the great draws of this novel seems to be the innovation of telling a story set among the Mormons—by someone who knows what she’s talking about! That might sell the book, but it won’t keep people coming back, methinks. And probably won’t be enough to get folks interested in other “Mormon books” either. I hope it works to sell this one though, and we can see what happens from there. $65,000 according to the webpage, but $100,000 according to the promotional information I received earlier by mail. I know nothing about the machinations of big campaigns like this, but that’s a substantial difference and I wonder what it means, if anything? 3 National market, consumer-facing, solo print ad minimum, special attention to Mormon markets (UT, CO, WA, OR). I’m fascinated that CO and WA and OR better meet the criteria of “Mormon market” than, say, AZ or ID or CA. Incidentally, I know less about geographic distribution or church-activity levels within the states, but for those playing at home, the seven states above boast, respectively, 1,975,939 and 149,876 and 279,492 and 152,011 and 410,263 and 425,739 and 780,200 Mormons. I’m not surprised they’re expecting to find interested buyers in Mormon markets, but I am surprised that most of the blurbs are aimed at those who aren’t Mormon. I wonder if they’ll consider an alternate cover from a reviewer like myself or Kellie to assure LDS readers they’ll be welcomed here? Or, perhaps, they’re courting [see point 2 below]? Harrison is a practicing member of the Mormon church, and offers an unprecedented1 glimpse into the most mysterious aspects2 of the Mormon faith and community. 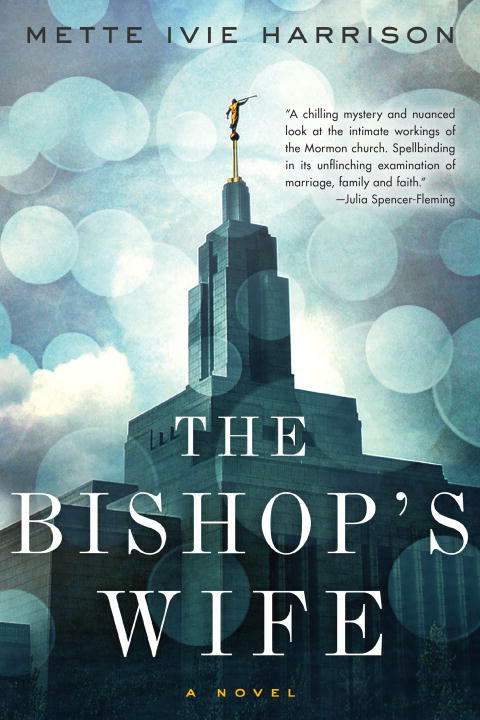 The Bishop’s Wife is bound to be controversial, loved, and hated both inside and outside of the Mormon community3: the main character is both a woman of faith and a sharp critic of the church’s gender dynamics and secrecy. 1: Well….maybe. I mean—I could point you to a lot of other books (Magdalene! Bound on Earth! Angel Falling Softly! ), but to the broad national audience being aimed at here, it’s most likely quite true. 2: I really wonder what this means. I mean—temple clothes get mentioned and some aspects of ceremonies get touched, but endowment exposÃ© this ain’t. And so what exactly are these most mysterious aspects? Is it basic cultural stuff like what bishops do and what funerals are like and that we hope kids get married in the temple? I suspect that, yes, in fact, a lot of this stuff will seem mysterious. But “most” seems to be pushing it. 3: I’m all for marketing potential controversy, but allow me to be the reasonable counterbalance as I say wooaaah, horsey. 4: I wonder if the broader marketing aim is to push the book on other religious people? Are we assuming atheists won’t be able to stomach this? Or are we not worried about them picking it up on their own because it’s only Methodists and Baptists and Buddhists who find Mormons impossibly alien and often offensive? Anyway, that’s enough from me on this. Hey, the amazon page lists A Motley Vision quote, too! My main interpretation of all of this is that the marketing is trying to get non-Mormons to pick up the book, with the assumption that Mormons will already be interested in it. Not sure about the states targeted. I know that Soho has some specific mystery bookstores in Colorado they love. I think the idea here isn’t that what I reveal about Mormonism is like a temple ceremony reveal, but rather than the way I am able to make a Mormon character seem so sympathetic and to explain Mormonism without being either judgmental or apologetic, if that makes sense. As for the book being loved and hated, well, um, yeah, I’m getting a lot of both those sides on goodreads so far. The LDS Church is the second largest religious denomination here in Oregon (behind Catholicism), Oregon has a fabled reading culture (readers, bookstores, and writing communities), and a large metro area/media market. I suspect lack of a large metro/media market is why a push wasn’t made in ID, and California Mormon population (while large in Church terms) is just a drop in the bucket compared to CA’s total population. The difference between 65 and 100 may seem big, but it’s not *that* big. By that I mean it’s within the range of a pretty significant but not blockbuster launch. Or to put it another way: there a not a lot of books that get that much of a marketing budget so this represents a major push from and act of faith by the publisher. Oh, I didn’t explain why the difference isn’t that big. From an advertising standpoint, the saturation you get with 65 vs. 100 is such that there’s not a huge difference as opposed to the difference between, say, 40 and 65. Or 20 and 50. Of course, it’s always great to have 35k more. But 65 and 100 are both in the same budget tier. Also: I at first was grumbling in my head about the marketing copy, but then I thought about marketing copy for almost any other book getting a decent push and how everything in it is heightened and reductified and the grumbling diminished. Wm—I wondered if that might be the case, but didn’t know. Lee—You make good points. I thought of the proportional question but didn’t feel like doing the math. Mette—I just read through the reviews and yep: people should have lots to talk about. Hey everyone! Get it for your bookgroup now! All of which suggests a competition between books that I don’t want to foster. Still, I figure that if my first recommendation is a good one, I might get more traction down the road. My wife thinks that if the sisters in our ward were able to accept the idea of a book about Mormons that they would have a lot to say about this one. I guess the real question is what’s the goal of the group? To have a pleasant feel-good experience or a vigorous discussion? I would say this novel leans more toward the latter.